With the amount of reliable water in reservoirs shrinking, water agencies set sights on groundwater transfers and more reservoirs. In the morning mist, bare land pokes above the surface of Lake Travis, a reservoir formed by Mansfield Dam on the Colorado River in Texas. Water levels in the reservoir, one of two main storage facilities on the river that are operated by the Lower Colorado River Authority, have dropped steadily during a three-year drought that is challenging the region’s water-management practices. Click image to enlarge. Two big reservoirs on the Colorado River in Texas are approaching a red line that would, in the short term, trigger mandatory water restrictions for the cities, golf courses, and companies that hold a contract with the Lower Colorado River Authority, the regional water manager. But in the long term, if the three-year drought in Texas continues, water rights in LCRA’s service area may need to be recalculated and reduced dramatically, potentially accelerating an ongoing search for reliable water supplies throughout central Texas. Drought of record: The worst water-supply conditions ever measured in a particular area. Firm Yield:The supplies that a water-rights holder can expect, relative to the driest recorded conditions. Interruptible Yield: Supplies that can be cut off during a drought. After a dry summer, the day of reckoning appeared imminent for the 965-kilometer (600-mile) stretch of the Colorado River in Texas that is managed by LCRA, but periods of heavy rain in September and October delayed the squeeze, at least for now. Climate forecasts show no sign that the region will soon break out of the low-moisture cycle that has cinched tight the flow of water into the river authority’s keystone reservoirs. The two reservoirs are now 35 percent full, the recent rains having increased storage by 4 percentage points since early September. But at the current rate of depletion, the reservoirs could fall below the drought-of-record threshold by early next year. Passing that mark would result in a temporary 20 percent cut in water allocations for all 136 contract holders, who would then implement the cuts according to their individual drought-management plans. 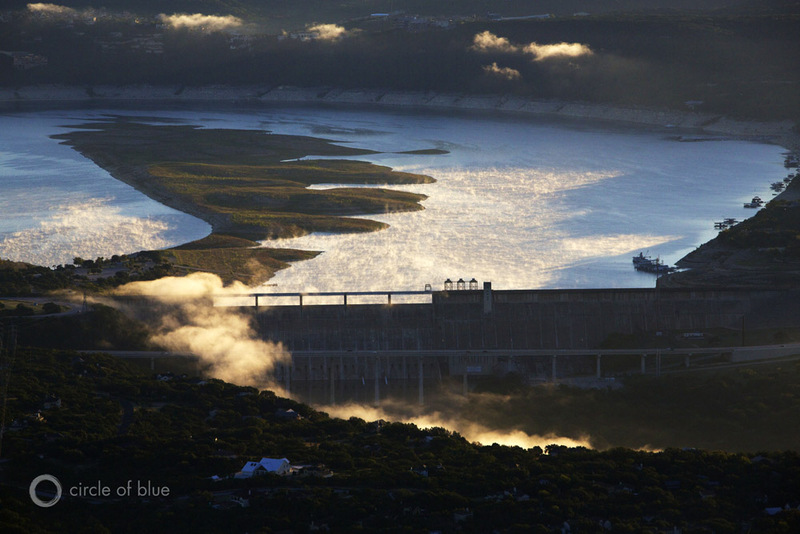 If the combined storage in Lake Travis and Lake Buchanan — part of the Highland Lakes reservoir system, upstream from Austin — falls below 30 percent capacity, or 740 million cubic meters (600,000 acre-feet), the LCRA board will declare a new drought of record for its service area, an action that will lead to systematic changes for water supplies in one of the state’s largest watersheds. 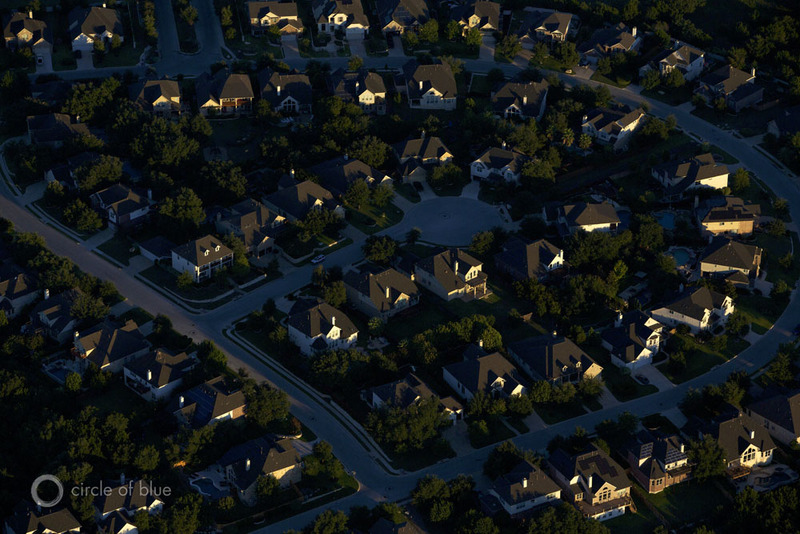 New housing developments encircle the Highland Lakes reservoir system, upstream of Austin. 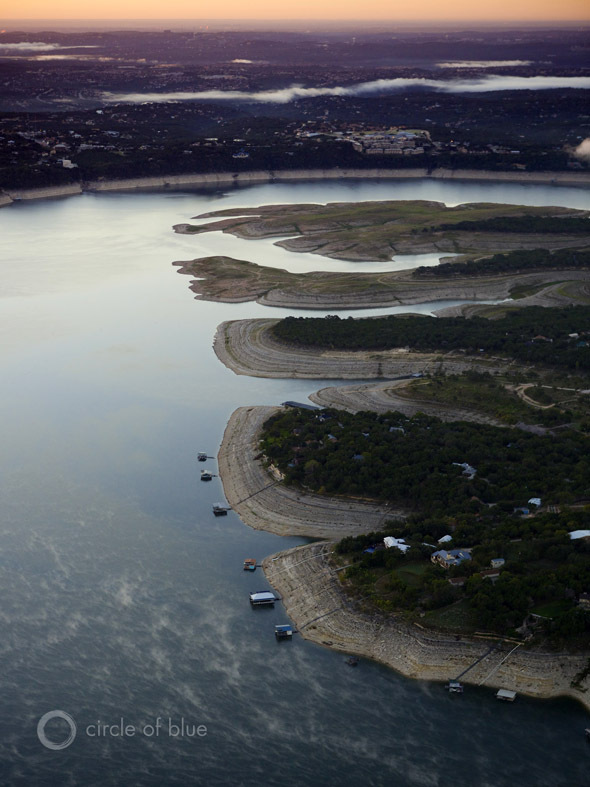 The Texas capital, which currently has 840,000 residents and is adding roughly 17,000 people per year, would see a cut in firm yield water supplies if Lake Travis and Lake Buchanan keep dropping. Click image to enlarge. In the long term, a new drought of record would have a domino effect on water supplies throughout the Colorado River Basin. Such a declaration would mean that the firm yield from LCRA’s reservoirs — the water rights that are guaranteed to contract holders — would be recalculated and reduced. On paper, cities would suddenly have fewer water rights than they used to. Preparation for this possible scenario is already underway in fast-growing central Texas — where Austin alone currently has 840,000 residents and is adding roughly 17,000 people per year — with cities looking elsewhere for supplies. But acquiring them could lead to conflicts with the rural water districts that would be targeted for transfers. LCRA, which supplies drinking water to more than 1 million people, has two immediate plans: build a new reservoir downstream to capture water during wet years and drill new wells in a nearby rural groundwater district. Austin, which gets all of its supply from the Colorado River reservoirs, is opening its own search. In August, the city council agreed to pay Alan Plummer Associates, a Texas-based consultant, between $US 200,000 and $US 892,445 for a drought-management plan. The plan will consider options to decrease demand, as well as increase supply. The Texas capital, which would see a cut in firm yield if Lake Travis and Lake Buchanan keep dropping, is not alone in the hunt for water, according to Michael Booth, a lawyer with Booth, Ahrens, & Werkenthin, an Austin-based firm that specializes in water law. Other cities in the region are also looking, even as conservation plans are currently keeping municipal demands stable. The shores of Lake Austin have receded, revealing dry land and forcing homeowners to extend their docks. New islands have appeared, boats are beached, and there is a tell-tale ring of dirt — evidence of the lake’s former level. Click image to enlarge. The worst period of drought in Texas was from 1950 to 1957. If there is little rain by the end of this year, the current drought — which stretches back to 2010 — will be the state’s second worst, according to John Nielsen-Gammon, the state climatologist. ‘Worst,’ in this case, is a qualitative measure, he told Circle of Blue, a combination of duration and intensity. Reservoirs statewide are at 60 percent capacity, and total storage is the lowest it has been in nearly three decades, according to the Texas Water Development Board. In 2011, the most severe single-year drought in its history, the state lost enough water to fill Lake Mead twice, according to a University of Texas analysis of satellite data. But Texas is a large state with a diverse climate — a moist east and an arid west. In practice, the records that matter are local. Drought of record and firm yield are concepts used for water planning by Texas’s river authorities and water districts, particularly for reservoirs. The idea behind firm yield is reliability: the supplies a city or power plant can expect, relative to the driest recorded conditions. The rest of the water in a reservoir is called interruptible yield, or the supplies that can be shut off in a drought. Groundwater is managed differently, depending on the characteristics of the aquifer. Groundwater districts in the Texas Panhandle that draw from the Ogallala Aquifer have annual pumping limits, to put the brakes on the finite aquifer’s decline. The Edwards Aquifer in central Texas, on the other hand, is managed more like a reservoir, because its porous limestone geology refills so quickly. Meanwhile, the state legislature endorsed a plan with bipartisan support earlier this year to create a $US 2 billion water fund from money in state reserves. Cities could apply for low-interest loans to fund water-supply and water-conservation projects. The measure, called Proposition 6, is on the November 5 ballot and is expected to pass. In January, the LCRA board approved two new supply projects. The larger is an old-fashioned scheme: a reservoir on the Colorado River in Wharton County, 80 kilometers (50 miles) from the Gulf of Mexico. The reservoir will provide an estimated 111 million cubic meters (90,000 acre-feet) of firm yield. The board set aside $US 18 million for the first phase of construction, and the project should be completed by 2017. The other project looks underground, to an aquifer east of Austin that recently reopened for development after a three-year moratorium. LCRA will spend $US 15 million on wells in Bastrop County, where the Lost Pines Groundwater Conservation District manages the supply. This year, Lost Pines approved withdrawal permits totaling up to 33.3 million cubic meters (27,000 acre-feet), said Jim Totten, the district’s assistant general manager. The largest permit went to Forestar Real Estate Group, a water marketer. Other permits were granted to LCRA, the town of Bastrop, and Heart of Texas, a water supplier. Earlier this month, Forestar inked a $US 1 million deal to sell its allocation to Hays County, south of Austin. Yet Forestar wants still more water from Lost Pines — nearly four times the amount that the groundwater district permitted the group to take — and Forestar could file a lawsuit to get it, the Austin American-Statesman reports. With the weather as it is, Totten expects even more applications for water from his district. Indeed, groundwater has been a savior across the Western United States in recent dry years. Farmers in New Mexico weathered record-low rainfall in 2012 by pumping more water from aquifers. The city of Amarillo in the Texas Panhandle is using groundwater exclusively for drinking water now that Lake Meredith, its main reservoir, has dried up. Downtown Austin sits on the banks of the Colorado River. The Texas capital is adding roughly 17,000 residents per year. Click image to enlarge. Setting a Precedent or Precedent-setting? There is precedent in Texas for recalculating a drought of record. The Brazos River Authority, whose domain stretches from the Panhandle to the Gulf of Mexico, did it around 2001 for Lake Proctor, one of 11 reservoirs that the authority operates. Contracts for water from the lake had to be renegotiated after the authority determined that firm yield was 30 percent lower than before, said Brad Brunett, water services manager for Brazos River Authority. Under either wet or normal conditions, rights holders received their full allotment. Only under drought conditions did the reduced rights come into play. Will it be there? That is the question LCRA now faces. If combined storage drops below 30 percent the answer is a clear “No” — at least, not in the expected amounts. How much is available? Another question that needs answering. LCRA told Circle of Blue that breaching the 30-percent storage threshold in the Highland Lakes means a new record is declared. A determination about how it will affect firm yield will come later, when the drought is over and complete hydrological data are compiled. But some cuts have already taken place: LCRA denied water to farmers downstream of the Highland Lakes reservoirs each of the last two years, for the first time ever, and Austin residents are only allowed to water their lawns once per week.